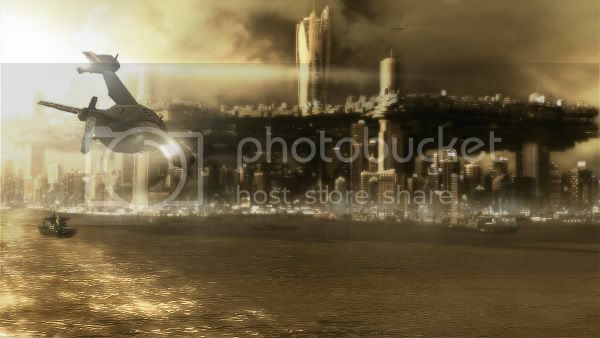 That quote comes from science-fiction writer and editor Lawrence Person, and the excerpt describes Deus Ex: Human Revolution protagonist Adam Jensen and the world he inhabits succinctly. Developers at the Eidos Montreal studio have done their homework, and they aim to weave a complex tale of social upheaval, revolutionary science, and corporate dominance in the same vein as cyberpunk novelists William Gibson and Neal Stephenson. I spoke with Narrative Director Mary DeMarle about storytelling in the upcoming prequel, where she discussed how Human Revolution addresses the intersection of socioeconomic class and mechanical augmentation, technological progress and utopia, and the ultimate question: "Why do we do the things we do?" Bitmob: An unattributed saying goes along the lines of: "The measure of a society is in how they treat their weakest and most helpless members." In 2027, how does civilization stack up? What's it like to live in the cities of the world? Mary DeMarle: Mankind has made some pretty amazing scientific and technological advancements by 2027. They've cured a lot of diseases, taken on global warming, and improved green-energy solutions. Discoveries in biotechnology and the cybernetics field are enabling individuals to greatly enhance their physical and mental capabilities that improve their overall quality of life — but such advancements cost money. So, I guess the real answer to this question depends (as it does today) on where you live and what socioeconomic class you belong to in 2027. Overall, the world that exists in that year is a study in contrasts. The rich remain rich — isolated within halos of security and consumerism; the poor remain poor — held down by their governments and employers and forced into docility by the output of an ever-present media. Men and women who embrace the new cybernetic technologies — or, as we call them, "mechanical augmentations" — are able to break out of one class and into another, but not everyone around them wants or likes this. As a consequence, lines are being drawn. A new social divide is being created, with people on both sides facing a future that seems to be heading toward violence and upheaval. Bitmob: That augmentation forms a sort of class mobility is interesting — a concept that I'd argue Americans specifically value greatly. Does the narrative feature such mobility through augmentation? MD: The concept of augmentations as a form of class mobility underpins many of the dialogs, side quests, and character interactions you'll have as you progress through the game. You'll certainly be encouraged to think about it as you explore and investigate the main story mystery. But your decisions to acquire or upgrade Jensen's augmentations won't directly impact the narrative. You won't be changing Jensen's job or social class by deciding to upgrade his augmentations. Bitmob: The reveal trailer simultaneously evokes imagery of Blade Runner (the skyline of a city on top of a city) and Ghost in the Shell (the idea of controlling another's actions through a network interface). How do those films leave an imprint on Human Revolution's narrative? MD: I'm a huge fan of both of films, but I can't say they've left any more of an imprint on Human Revolution's narrative than William Gibson's Neuromancer series or Neal Stephenson's Snow Crash novel. All of these works are classics in the cyberpunk genre. They all create vivid pictures of a dystopian future, with technology and the very human struggles of believable characters at the center of their storylines. Hopefully, Human Revolution's narrative will achieve the same thing. Bitmob: Blade Runner explores the topic of transhumanism explicitly, but implicitly, the film questions what it is that makes us human. The “Human Revolution” subtitle (and the trailer’s use of the H+ symbol) suggests that these ideas will be integral to the experience. How will the game’s narrative explore them? MD: Like Blade Runner, Human Revolution explores transhumanism explicitly through Adam Jensen's personal experience and how he comes to grips with having been forced to be mechanically augmented in a world that views this technology as controversial. But on a more implicit level, we're asking players to explore the question, "Why do we do the things we do?" We're not trying to put this question in your face bluntly; instead, we're allowing you to explore it through all the choices (gameplay and story-wise) that you make during the game. Narratively, we're introducing characters who represent different answers to that question and giving dialog choices that let you decide how to interact with them. We're also offering side quests and critical path interactions that encourage you to think about and explore the question for yourself. 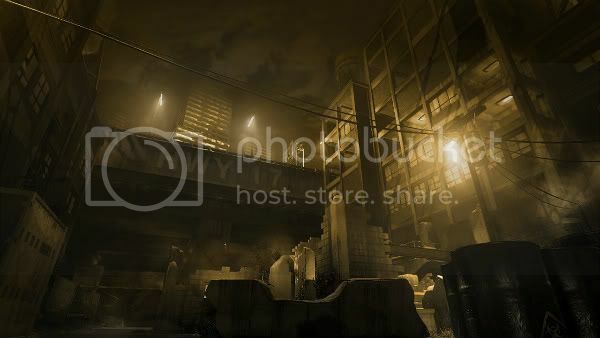 Bitmob: Classism forms a central component of Blade Runner’s imagery and narrative, and Human Revolution’s reveal trailer similarly evokes a stark dichotomy of haves and have-nots. How does Human Revolution feature issues of class within its narrative? MD: At the center of Human Revolution's narrative is the idea that mechanical augmentations can lead to a better life by giving you mental and physical advantages that, in turn, lead to better jobs and higher pay grades. But for many, the cost of buying augmentations keeps this dream out of reach. For others, implantation surgeries are the barrier because a rare percentage of people are genetically incompatible with the implants. Still others oppose the technology on moral grounds. All these reasons combined end up creating a new class divide in 2027 based on those who have mechanical augmentations and those who don't. Players will be exploring this issue through interactions with several diverse characters and organizations — all of whom have different opinions and views and who are trying to push their agendas forward. 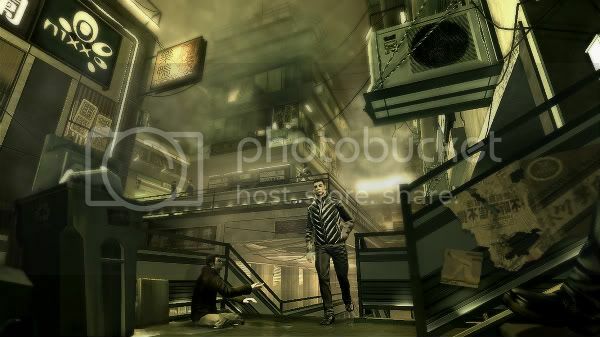 Bitmob: I listened to an interview where Deus Ex Dialogue Writer Sheldon Pacotti describes the original game’s emphasis on technology (nanomachines and sentient A.I., for example) as a "culture of machinery." Human Revolution takes place during a time when biomechanical rather than nanotechnological augmentation are state of the art. How does a “culture of machinery” pervade Human Revolution? MD: Without having heard Sheldon's interview, I'm not sure I can effectively answer this. I can say, however, that Human Revolution's storyline takes place 25 years before the original Deus Ex. Consequently, the technology it focuses on, mechanical augmentations, is actually a precursor to the nanotechnology that exists in Deus Ex. By the time 2052 rolls around, Human Revolution's technology will be seen as old and outdated…but that is, I believe, an aspect of the "culture of machinery" you're asking about. In Human Revolution, humankind is seen as striving for progress, chasing a dream of technological advancement that may (or may not) improve the human condition. Yet even as great progress is being made, the dream itself is fueling consumerism, creating a new class divide, and setting off ripple effects that will have lasting impact on the future of humankind. Bitmob: The question of whether technology improves the human condition speaks directly to the concept media theorist Neil Postman put forth in his book Technopoly: The Surrender of Culture to Technology, where he argued that Americans had placed their faith in the idea that "human progress and technological innovation are the same thing and that paradise can be achieved through greater and greater commitment to technology." The "culture of machinery" seems to embody a similar attitude. How does Human Revolution explore these ideas? MD: The question of whether or not technological progress will lead to paradise is as fundamental a question in Human Revolution's narrative as it was in the original Deus Ex. It's a question that never gets old, I think, and one that deserves revisiting in new and different ways. We're exploring it through both the game's central storyline and various side quests you might choose to undertake. 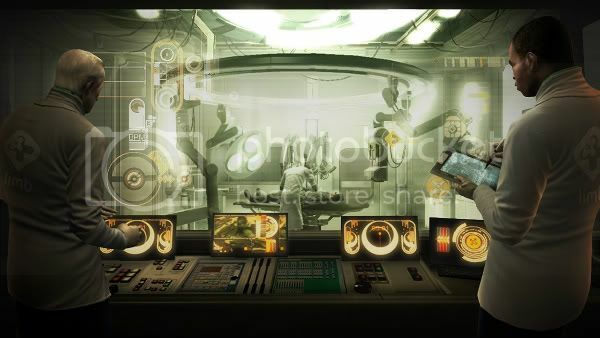 Characters you'll meet throughout the game will have opinions on augmentation technology, and several will try to push their philosophies on you as part of some deeper agenda. 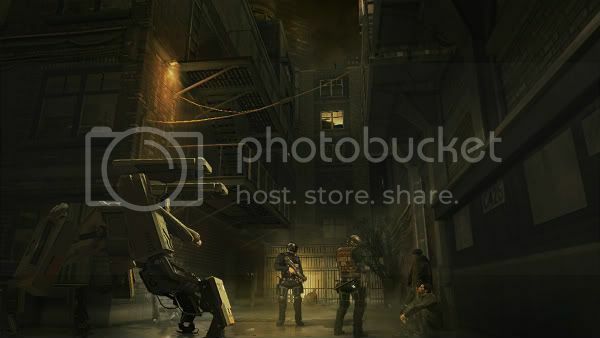 Bitmob: Deus Ex had a sense of irony in its settings: The first mission tasks players with eliminating a terrorist threat from the Statue of Liberty (i.e., a group purporting to advocate for freedom attacks a symbol of freedom). UNATCO’s headquarters is also situated near the base of the statue, and players later discover that the organization is covertly undermining civil freedoms. How does Human Revolution’s narrative embrace such irony? MD: I guess one of the ways we're embracing irony is through the narrative's central issue: In the game, mechanical enhancements are being touted by many people and organizations as something that can improve your life. Yet when you actually have them, you find yourself facing the unrelenting prejudice and hatred of people who oppose augmentations for a variety of reasons. Is this actually an improvement? Adam Jensen never had a choice in getting augmented — his implants were "forced" on him to save his life — so this question crops up again and again. We're embracing irony through the narrative in several more ways than this, but it would spoil the experience if I went into too many details. So I'll refrain…for the moment. 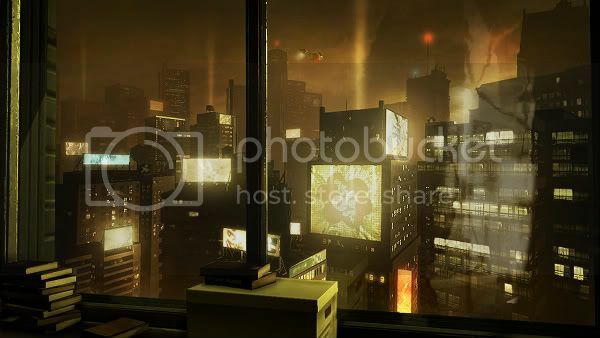 Bitmob: Somewhat prophetically, Deus Ex’s theme of a climate of fear — embodied in the game’s depiction of counterterrorism policies — reflected America’s real War on Terror in hindsight (the artists who worked on the 2000 release of Deus Ex even unintentionally omitted the World Trade Center towers from the New York City skyline, which Ion Storm decided to blame on a terrorist act to avoid redoing the art). Do similar themes — such as economic inequality and exploitation or the belief that technology and surveillance grant security — play into Human Revolution’s conspiracy theories? MD: Without giving too much away, I'd say yes; there are a number of themes similar to those you've mentioned that play into Human Revolution's conspiracy theories. Will they end up reflecting near future events as well as Deus Ex did? I don't know. But I do know that we did an awful lot of research when we first began developing our story. We looked at everything from current events and technological trends to biographies and histories of influential people and organizations. Then we built a story that was grounded in today and attempted to push it forward. As a result, we have Adam Jensen working as a private security specialist for one of America's most innovative biotechnology corporations. He's not working for a government or world government-sponsored organization like JC Denton was in the original game because in Human Revolution, corporations have more power than governments. They've broken free of the bounds of nation-states and are eclipsing the old world powers in terms of their influence, power, and multinational reach. More often than not, governments can't stop corporations from doing what they're doing in 2027; they can only express dissatisfaction after the fact — something we've witnessed in our own world recently, when U.S. President Barack Obama expressed frustration over the oil industry eluding governmental control…. 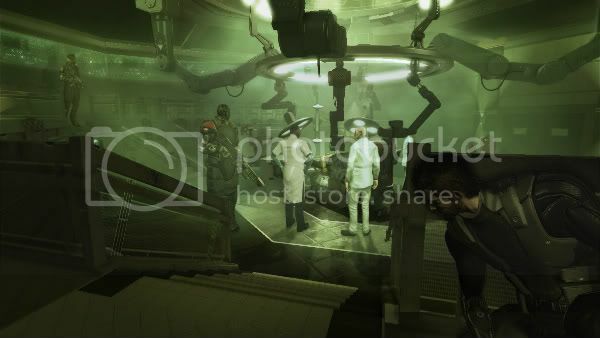 Bitmob: I’m a big advocate for player-initiated narrative, and the original Deus Ex was somewhat successful in adjusting how the story unfolded based on player choice and action. How does Human Revolution’s narrative structure similarly bend to the will of those in front of the screen? MD: From a high level, the story within Human Revolution is linear: Every person who plays it will experience certain key moments and underlying plot points that push the narrative forward as they progress through the game. But choice and consequence is a central tenant of the license, so it was very important to us that the story find ways to reflect this. Certain aspects of the narrative will change depending on player actions: Important characters might live or die, disappear from the plot, or come back again later in response to actions taken at certain moments. Character dialogs and some text-based elements also change throughout the game to reflect what players have done in various missions. So while the underlying story is the same for everyone, the way each person experiences it will be significantly different.